Alexander Nikolayevich Scriabin (Russian: Алекса́ндр Никола́евич Скря́бин; 6 January 1872 [O.S. 25 December 1871] – 27 April [O.S. 14 April] 1915) was a Russian composer and pianist. Scriabin, who was influenced early in his life by the works of Frédéric Chopin, composed works that are characterised by a highly tonal idiom (these works are associated with his "first stage" of compositional output). Later in his career, independently of Arnold Schoenberg, Scriabin developed a substantially atonal and much more dissonant musical system, which accorded with his personal brand of mysticism. Scriabin was influenced by synesthesia, and associated colours with the various harmonic tones of his atonal scale, while his colour-coded circle of fifths was also influenced by theosophy. He is considered by some to be the main Russian Symbolist composer. 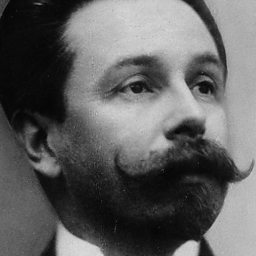 Scriabin was one of the most innovative and most controversial of early modern composers. The Great Soviet Encyclopedia said of Scriabin that "no composer has had more scorn heaped on him or greater love bestowed." Leo Tolstoy described Scriabin's music as "a sincere expression of genius." Scriabin had a major impact on the music world over time, and influenced composers such as Igor Stravinsky, Sergei Prokofiev, and Nikolai Roslavets. However Scriabin's importance in the Russian and then Soviet musical scene, and internationally, drastically declined after his death. According to his biographer Bowers, "No one was more famous during their lifetime, and few were more quickly ignored after death." Nevertheless, his musical aesthetics have been reevaluated, and his ten published sonatas for piano, which arguably provided the most consistent contribution to the genre since the time of Beethoven's set, have been increasingly championed. Pianist Peter Donohoe plays the first movement from Scriabin's Sonata-Fantasy live. Mats Lidström and his son Leif Kaner-Lidström play Scriabin live on in the studio. Bill Mival compares recordings of Scriabin's Prometheus and makes a personal recommendation. The life and career of Alexander Scriabin is revealed by Donald Macleod.